I thought I saw some sort of backhoe in the NE corner of the lot digging away on Wednesday afternoon. Anyways, I'm not wild about the giant alleyway through the middle of the block. These are becoming way too common, and they dilute the already miniscule street-activating presence of downtown land uses. This is still a huge improvement, but that's my main gripe compared to the type of development you'd see a little closer to the downtown core. It's not like the block will be ringed with a dozen storefronts or something. I think the backhoe was for taking down the billboard. I saw them taking it down a couple days ago. Status update: there's currently a parked backhoe and some stored jersey barriers in the northeast corner. If there's any actual activity, it's in the extreme southwest corner that I can't see (i.e., I don't think there's any activity). I have noticed all 3 of their lots have been closed this week. The full block, the half block by their current building and the quarter block next to the Sexton building. Huh. I thought the point of the parking ramp on their current block was that it was to be done and parkable before they closed down the full block lot, to prevent employee parking disruption. They were putting jersey barriers up around the full block this afternoon and there's a Reuter Walton trailer on the half block, which has chain link around half of the lot too. Sherman Associates had struck a deal with Thrivent Financial to develop half of its block headquarters in Downtown East with an apartment tower and hotel, but Sherman has pulled out of the project due to rising construction costs, higher interest rates and more conservative lending. Thrivent is now inviting other developers to share their ideas for the site, the company said. Hopefully with projects deep into construction on the remaining block-sized surface lots downtown so the next cycle doesn't have as much low hanging fruit to work with. Haven't people been asking that question the past 3-4 years? Unless the economy goes into a deep recession, I doubt there will be a sustained downturn in the level of development that's been happening. There are plenty of national developers that have the cash to keep things moving. High construction costs aren't going away anytime soon (but I think this will lead to more innovation). The fact we've seen new players enter our market in recent years is a healthy sign as well. 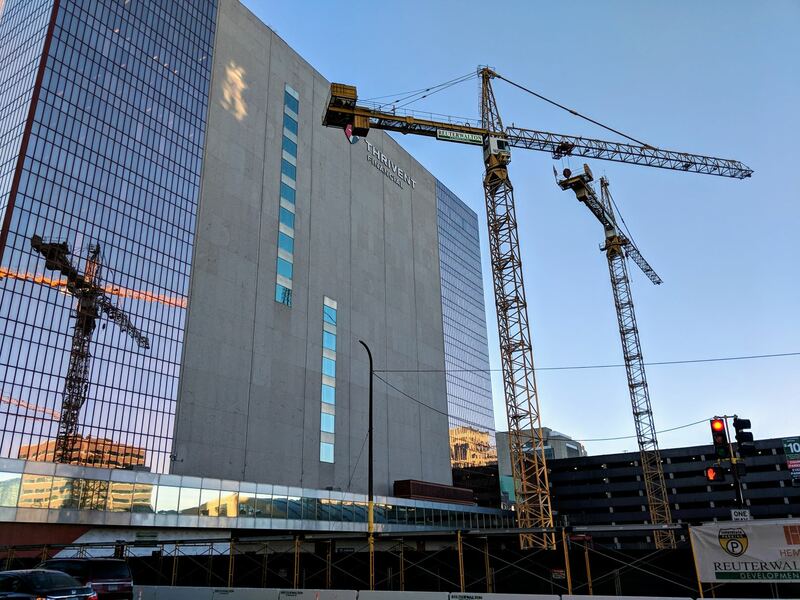 We have reached a point where downtown Minneapolis is ~that~ popular to support a couple projects every year despite what the vacancy rate looks like or how the economy is performing overall. I couldn't agree more! I thought that headline was pretty dumb. 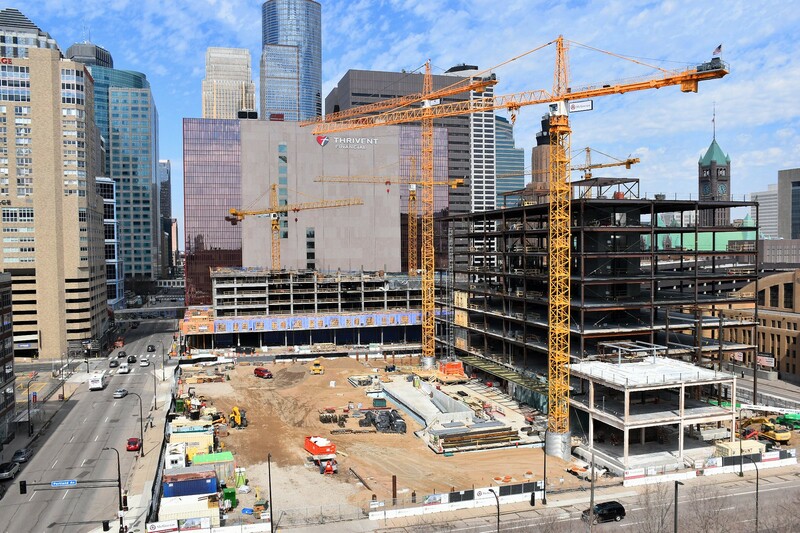 Minneapolis has had $1 Billion+ in development every year for the past 6 years now. Sometimes it feels like people think Minneapolis is some sleepy hobunk town in western Montana... We're growing faster than most all midwestern cities, we have one of the lowest unemployment rates for a metro area in the nation, we have a highly educated workforce, etc. etc. etc. There are many reasons people are moving here, and unless the economy falls to shambles, things aren't likely to change. So many 1 bedrooms and Studio's in a building with a daycare? Just seems childish, with no room to grow. Doesn't really matter anymore though, as they apartment/hotel portion of the project is currently not happening as planned. Perhaps the next developer will be more thoughtful. We're up to four tower cranes between the two Thrivent blocks. 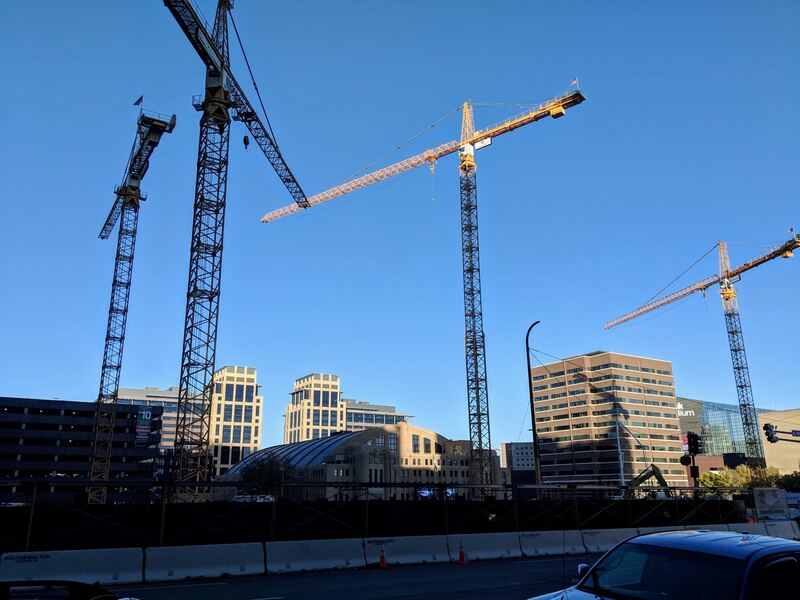 Nice, picture of all the cranes. Almost makes ya forget those cranes are a good x2 the height this building would every be even with a 40ft. flag pole on top.. lul. Both Thrivent blocks and the crane for the city office building. Have they figured out what’s going to be built on the southern portion of the driving book yet? The part of the block not currently occupied by the new headquarter building. Literally on the previous page. I haven't heard about any sort of replacement development for the other half of the block yet.